One of the first steps to CREATE GREAT LOVE is to believe in it! You have to believe it is possible in order to create it for yourself in your life. I feel so truly grateful to have always known and believed in LOVE. It’s just a part of who I am. What is truly amazing about that is I never had any demonstrations of it in my experience growing up. I never saw those around me demonstrating GREAT LOVE but somewhere there was a knowingness that it existed, that is was real and that is was possible for me and for everyone. Great LOVE is truly magical…Just Believe! My picture this week continues the hat theme! 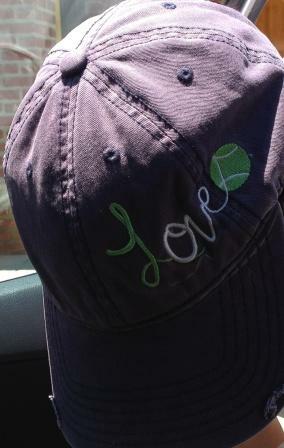 My dear friend who is a huge tennis fan got into the car with me and this is what she was wearing…. This entry was tagged Anthony Robbins, Belief, Believe, Create Great Love, Feelings, Future, Grateful, Gratitude, Love, Past, Relationships, Tennis, Thoughts, Tony Robbins. Bookmark the permalink. Thank you for visiting my blog. I’m glad you enjoyed it!